EMMA – Espoo Museum of Modern Art, WeeGee Exhibition Centre in Tapiola, Espoo. 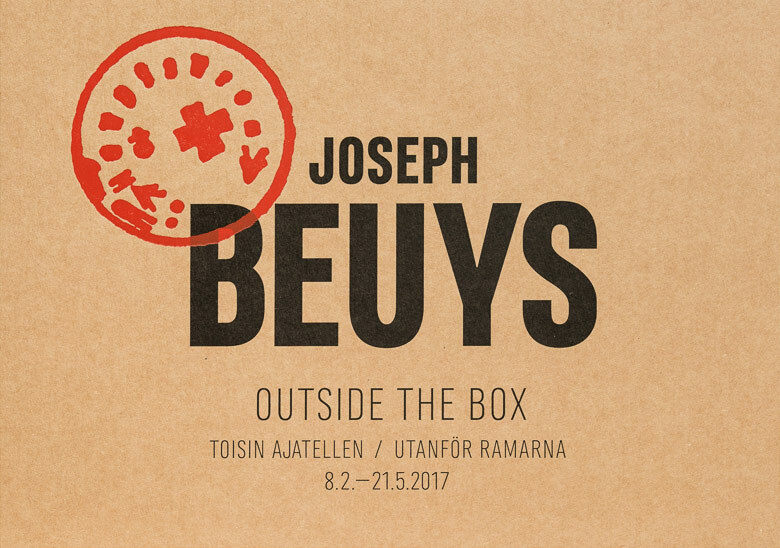 First exhibition in Finland in 30 years on Joseph Beuys opens at EMMA – Espoo Museum of Modern Art. The core of the exhibition titled Outside the Box is the unique collection and archive from Museum Sztuki in Lódź, Poland - the oldest European museum of modern art. Outside the Box presents the collection for the first time in this magnitude. The exhibition is co-produced by the museums and curated by Lukasz Zaremba, Researcher of Museum Sztuki and Pilvi Kalhama, Director of EMMA. Museum Sztuki’s collection of works by Joseph Beuys is a creation and donation of the artist himself. The compilation, called Polentransport, is one of his most spectacular actions. It is an act of solidarity with Poland which in 1980–1981 saw a momentary release from the grip of the Communist party. 10 million citizens joined the Solidarity movement. Enabled and inspired by this uprising, Beuys went to Poland in 1981. He brought along his personal archives (printed material, posters, photos, drawings, prints, objects and sound pieces) documenting 30 years of his production. He donated the entire collection, contained in a wooden trunk, to the museum in Lódź. Polentransport was intended to promote change, as a symbol of free creativity and action. The exhibition presents Beuys’ topical thinking through four themes: ecology, economy, democracy and margins. Beuys’s ideas of peaceful change, activism or recycling immaterial conceptual art are still relevant today. His art spurs us to consider what we can do about ongoing injustices. Joseph Beuys is a major 20th century conceptual artist. His influence and prominence is of the same calibre as that of Andy Warhol and Marcel Duchamp. He was one of the artists with the greatest influence on the concept of art in the 20th century. For Beuys, creating art represented a humanitarian potential to transform society. It inspired his concept of “social sculpture”, which makes everybody an artist. Beuys believed in the healing power of art. For him, it meant harmonising society and the potential and capacity to tackle social injustice. His conceptual art was above all creative action for social change. He explored the possibilities of replacing mechanisms based on economic value and ownership With the emerging environmentalism, Beuys was one of the founders of the German Green Party. He was also a founding member of the Fluxus movement, which later became important in the rise of ecological art and land art. EMMA – Espoo Museum of Modern Art is one of the most important art museums in Finland. EMMA’s exhibition rooms are divided between a presentation of the Saastamoinen Foundation Art Collection and changing exhibitions. Through its collection and exhibition activities, EMMA profiles itself as a museum of domestic and international modernism, contemporary art, and design. EMMA is located in the WeeGee Exhibition Centre in Tapiola, Espoo.